Takeshi Murase, broadcast and comedy writer as well as Osaka Broadcasting Arts College graduate and special lecturer, received an honorable mention from the selection committee for his work “Hanashika Monogatari～Asakusa wa Kyo mo Nigiyaka Desu～” at the Dengeki Shosetsu Grand Prize Awards Ceremony held on October 1 of last year. Mr. Murase’s work was selected from 5,088 other entries. “Hanashika Monogatari～Asakusa wa Kyo mo Nigiyaka Desu～” was published by Media Works Bunko and went on sale on March 23 of this year. The novel depicts a young man who wholeheartedly pursues his dream of becoming a traditional Japanese comic storyteller (rakugo-ka). 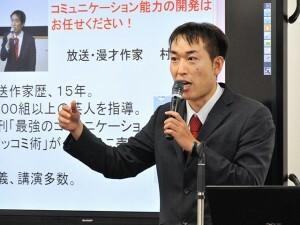 Mr. Murase himself never gave up on his own dream of becoming a novelist and finally realized his dream just before turning forty after brushing up on his skills at a professional training college. It’s a story of the protagonist’s fervent resolution, a story that overlaps with Murase’s own story. Even someone with no interest whatsoever in rakugo storytelling would enjoy the novel. Mr. Murase was born in 1978 and is currently forty years old. He graduated from the Law Department at Kansai University and then later enrolled in Osaka Broadcasting Arts College. He studied in the TV Program Production Course and began working as a writer primarily in Kasai after graduating, becoming involved as a writer on such projects as “Bakusho Red Card,” Kingu obu Konto,” and “Enta no Kamisama.” He had also coached more than 2000 comedy duos. His work “Isshun de Issho! Hito wo Hikitsukeru Hanashikata” was published by Magazine House, which sparked his work giving lectures on communication skills. He currently gives more than 100 lectures each year, which have received favorable reviews with comments such as “He was really easy to understand, and I was able to put what he said into practice right away” and “the way I create interpersonal relationships has shifted 180 degrees.” Another one of Mr. Murase’s works, “Saikyo no Communication-Shikkomi Jutsu” was also published by Shodensha in 2015.